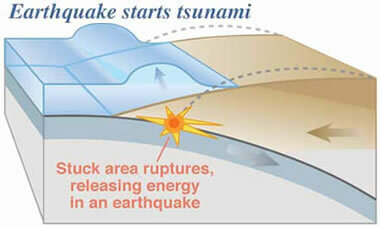 A tsunami is a large ocean wave that is caused by sudden motion on the ocean floor. This sudden motion could be an earthquake, a powerful volcanic eruption, or an underwater landslide. The impact of a large meteorite could also cause a tsunami. Tsunamis travel across the open ocean at great speeds and build into large deadly waves in the shallow water of a shoreline. Most tsunamis are caused by earthquakes generated in a subduction zone, an area where an oceanic plate is being forced down into the mantle by plate tectonic forces. 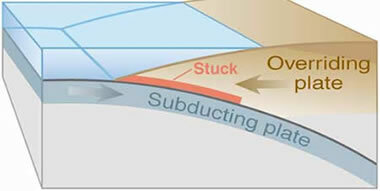 The friction between the subducting plate and the overriding plate is enormous. 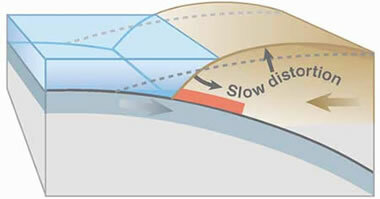 This friction prevents a slow and steady rate of subduction and instead the two plates become “stuck”. Energy accumulates in the overriding plate until it exceeds the frictional forces between the two stuck plates. When this happens, the overriding plate snaps back into an unrestrained position. This sudden motion is the cause of the tsunami – because it gives an enormous shove to the overlying water. At the same time, inland areas of the overriding plate are suddenly lowered. The moving wave begins travelling out from where the earthquake has occurred. Some of the water travels out and across the ocean basin, and, at the same time, water rushes landward to flood the recently lowered shoreline. Many people have the mistaken belief that tsunamis are single waves. They are not. 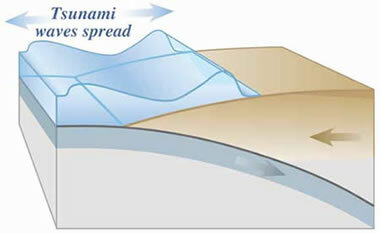 Instead tsunamis are “wave trains” consisting of multiple waves. The chart below is a tidal gauge record from Onagawa, Japan beginning at the time of the 1960 Chile earthquake. Time is plotted along the horizontal axis and water level is plotted on the vertical axis. Note the normal rise and fall of the ocean surface, caused by tides, during the early part of this record. Then recorded are a few waves a little larger than normal followed by several much larger waves. In many tsunami events the shoreline is pounded by repeated large waves. This entry was posted in oceans, Quakes. Bookmark the permalink.